NASA’s MESSENGER spacecraft captured this image on January 14, 2008, during its closest approach to Mercury. The image reveals a variety of intriguing surface features, including craters as small as 300 yards across. 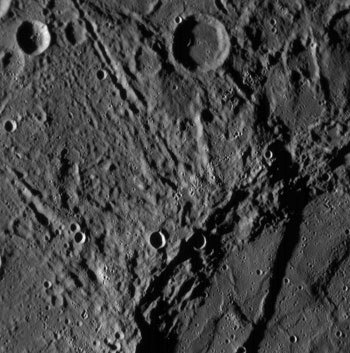 The image also shows landscapes near Mercury’s equator on the side of the planet never before imaged by spacecraft. These highly detailed close-ups enable planetary geologists to study the processes that have shaped Mercury’s surface over the past 4 billion years. 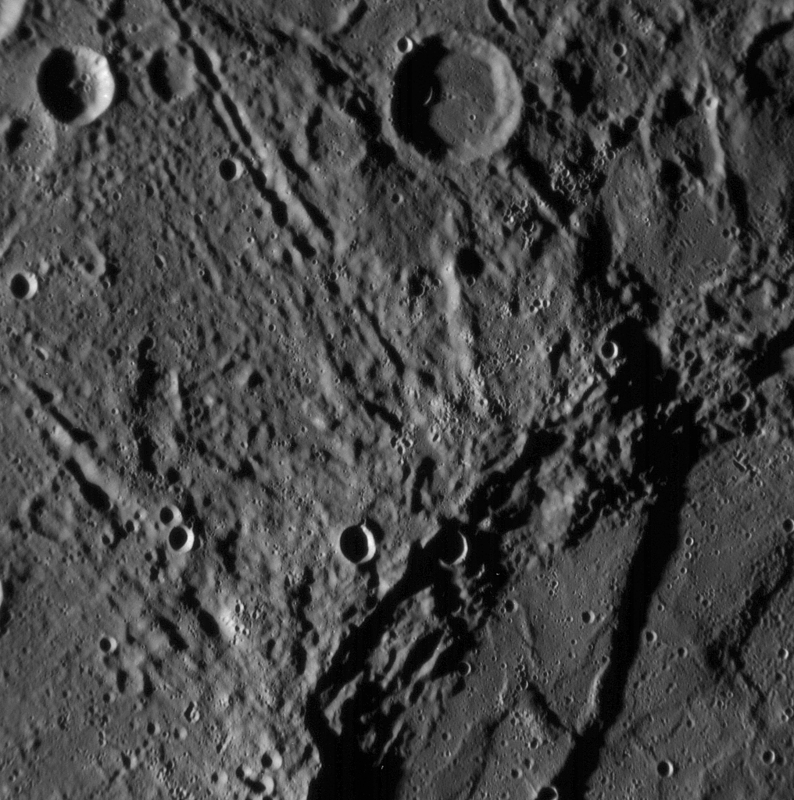 One of the highest and longest scarps cliffs yet seen on Mercury curves from the top center down across the right side of this image. Great forces in Mercury’s crust have thrust the terrain occupying the left two-thirds of the picture up and over the terrain to the right. An impact crater has subsequently destroyed a small part of the scarp near the top of the image. This image was taken from a distance of 3,600 miles from surface of the planet and shows a region approximately 100 miles across. In 1787, astronomer William Herschel discovered the Eskimo Nebula. From the ground, NGC 2392 resembles a person’s head surrounded by a parka hood. In 2000, the Hubble Space Telescope imaged the Eskimo Nebula. From space, the nebula displays gas clouds so complex they are not fully understood. The Eskimo Nebula is clearly a planetary nebula, and the gas seen above composed the outer layers of a Sun-like star only 10,000 years ago. The inner filaments visible above are being ejected by strong wind of particles from the central star. The outer disk contains unusual light-year long orange filaments. The Eskimo Nebula spans about 1/3 of a light year and lies in our Milky Way Galaxy, about 3,000 light years distant, toward the constellation of the Twins (Gemini).